In 1990 Tatsunoko Studios of Japan released the “science-fiction historical gag battle anime” known as Kyattou Ninden Teyandee. 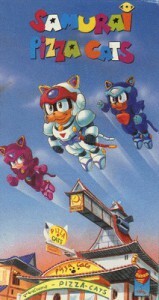 It was fan-subbed in the U.S. as Ninja Pizza Cats, and eventually Saban Entertainment released it to television in a dubbed version called Samurai Pizza Cats. For many years, the rights to the show have been up in the air, but now Discotek Media have announced they will soon be releasing the entire series to DVD. According the review at Anime News Network, the series “revolves arouund Nyankii, a secret ninja team that protects the robotic animal inhabitants of Edoropolis (Little Tokyo) from the evil ninja organization Karakara.” That hardly begins to describe just how crazy this thing is. Discotek will be releasing two different DVD box sets: A 52-episode dubbed version and a 54-episode subtitled version. Two of my favourite things - pizza and cats - together once more! Will both versions be titled "Samurai Pizza Cats", or will the subtitled edition have the CORRECT title of "Ninja Pizza Cats"? As anime fandom pointed out at the time, samurai and ninja ain't the same breed of cat. Also, most fans who were familiar with Tatsunoko's original version felt that it had much better music. Saban's music wasn't awful, but the Japanese was definitely superior. The Japanese name for the team, the Nyankii, combines the Japanese nyan (their version of meow) with Yankees -- the three main pizza cats wear Red, White, and Blue costumes. The Japanese title, "Kyattou Ninden Teyandee", is a mashup of English (cats), Chinese (ninden), and then-current Japanese schoolyard slang (teyandee -- we're gonna get you!). It was gloriously hokey and a lot of fun. The big gun that the Nyankii team is shot out of is a visual parody of the giant gun in the then-recent live-action "Future Ninja" s-f/fantasy movie that is also great gonzo fun. Thank Roscoe that Discotek Media is also releasing a subtitled edition of the original Japanese anime TV series! A quick check with IMDb shows that the correct title, or anyway the American release title, of “Future Ninja” is “Cyber Ninja” (“Mirai Ninja”, which means “Future Ninja”), released in 1988. The best character is the Dark Overlord, the demon spider-costume-wearing villain (Masaaki Emori), who is obviously having too much fun chewing up the scenery as flamboyantly as he can (but totally straight-faced). See it if you can. Did you know that American Furry fan Ted Sheppard in Arizona has gotten a big collection of the original anime cels and background paintings from "Kyattou Ninden Teyandee" and is selling them? The Japanese box set will be sold under the name "Legendary Ninja Cats"